Florida Military Surf Club is what Living in the Sunshine State is All About. It’s early. The crack of dawn. The sun is just starting to peak over the horizon of the Atlantic Ocean—its golden light warms a thick layer of billowing clouds floating in the far-off morning sky. The sound of the ocean swelling and breaking on the shoreline is tranquil, yet mighty—it’s a meditative juxtaposition that’s reminiscent of the balance required for both life—and surfing. Like surfers and waves, some things in life just seem to naturally go well together. Take veterans and Florida for example—it’s a combination that just works. From the strong veteran community found here in the Sunshine State, to the endless array of outdoor activities, life for veterans in Florida is not just good, it’s downright great. This month, Veterans Florida headed to St. Augustine Florida to meet with an epic group of vets—a bunch of guys who’ve come together to share in both a common bond and a shared passion; surfing. Florida Military Surf Club talked candidly with us about all kinds of things—from comradery and opportunity to finding peace of mind while floating on a Florida wave. Veterans Florida: Gents, thanks for taking a break from the waves to talk to us about all things Florida. Florida Military Surf Club: No worries-happy to share what we’ve got going on here! VF: Alright, so let’s get to it! How’d Florida Military Surf Club get started? FMSC: Well, we all started surfing individually, and some of us started working together. We’d be out here early in the morning, or when we had free time and one day we were out here and thought, “we really should start some kind of club.” It was one of those things that as soon as it was said, everyone was like, “yeah, I’ve been thinking about that for a while.” I mean, from the beginning it was going to be something that was low-key since we were surfing together anyways. What we really wanted was something that would just help us recognize one another so you were never out there surfing alone— a way to kind of look out for each other and enjoying the surfing together. VF: It really is awesome to see you guys establishing such a unique community, within our already distinct veteran population. 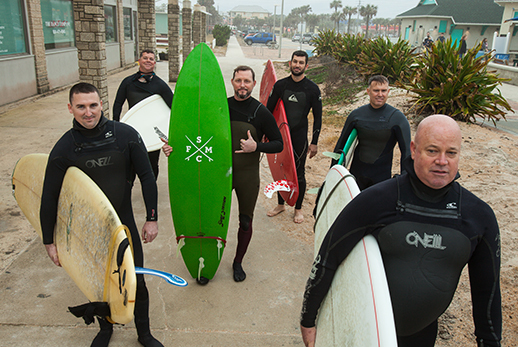 What’s it like coming together as vets, to do something as enjoyable as surfing with each other? FMSC: Honestly, it’s just important for us to get around like-minded people who know where you’re coming from. People you relate to as fellow vets—that you can go out and surf with as well. It’s just a different vibe to be out on the water with a group of military folks—a level of trust that you might not have when you’re out there with guys you don’t have those shared experiences with. VF: What is it about surfing that has become so important to each of you? What is it that motivates you to come out here early in the morning, rain or shine? FMSC: Listen, I started surfing because after coming back from Iraq I was having some issues, and I saw a shrink for about a year. His recommendation to me, almost immediately after he found out I was interested in surfing, was to get out here and surf every day. I grew up as a skateboarder, I didn’t really surf—but I went out that day, bought a board, bought a wetsuit; got beat up for that first year trying to figure out how to surf. But what that does, what it teaches your body, mind, and soul, is how to overcome those issues and eventually diminish them, until you’re able to turn it into a positive thing. There really is something special about being out on the water; seeing the sunrise, or the sunset from your board, embracing the flow of the ocean—which is kind of this life force of its own. It’s comforting, and for a lot of surfers that’s what they enjoy—it’s the thrill of it, but it’s also the peacefulness of it. VF: What is it, beyond surfing, that you enjoy most about calling Florida home? FMSC: Well, beyond being able to surf pretty much year-round? It’s always being able to be outdoors; to get out of the house and stay active. You’ve got to remember, people from all over pay a lot of money to vacation in tropical places, and we get to live here! Living in Florida means that every day is a vacation for us. The fishing is incredible, the natural resources are abundant—from state parks to campgrounds, there’s really always something to do. VF: For a veteran who is thinking about moving to Florida, what would you tell them to help make the decision? What about Florida makes it the perfect place for vets? FMSC: Almost anywhere you live in Florida there’s a military base nearby, which means there will be veteran services, as well as a really strong veteran community. Veterans really gravitate here—so not only will you run into guys from other services, you might run into guys you served with who have decided to make Florida home. I mean, even the Governor (Rick Scott) is a Navy veteran, so literally from the top down there’s a respect and understanding of creating a system that really works to benefit veterans. VF: Gents, thanks for taking some time away from the waves this morning to talk to us about living, and surfing in Florida. Anything else you want to tell your fellow vets before we wrap? FMSC: If you’re a veteran, looking to be around other veterans, looking to save some money with the tax rates Florida offers, looking to start a business or a new career-this is a great place to settle down. Living in Florida Really is a Lifestyle. Florida isn’t the sleepy retirement state that your grandparents flocked to during the cold winter months. It’s a diverse state—from bustling modern cities like Miami to laid-back surf towns like St. Augustine. There’s a rich history here too, a culture that’s unlike anything, anywhere else in the country. For more information about the Florida Military Surf Club, visit https://www.facebook.com/floridamilitarysurfclub/. If you’re ready to learn more about living the Florida lifestyle, check out Veterans Florida. We’re here to make your move to Florida as easy as possible; from help finding your next career, to training you to start your own business; and we can connect you with a few surfers who wouldn’t mind helping a fellow vet find a wave of their own to ride in on.